City aim for a record-breaking Tuesday night in the Carabao Cup 4th round as they welcome high flying Wolverhampton Wanderers to the Etihad Stadium. On the back of their 11th straight win at the weekend against Burnley, the Blues and specifically Sergio Aguero will look to make history with, hopefully, a glimpse of City’s future on show. Pep Guardiola appears set to freshen up the starting line-up, after his side looked tired in spells of their 3-0 victory on Saturday. The manager hinted at Aguero breaking City’s all-time goal scoring record against Wolves in Saturday’s post-match interview, and the Argentine striker looks certain to start as he looks to build up match fitness and score his eagerly-anticipated 178th goal. Pep may include a handful of the CFA’s youth prospects, with the exciting Brahim Diaz, Oleksandr Zinchenko and towering centre-half Tosin Adarabioyo all in with a chance of making an appearance. Yaya Toure and Ilkay Gundogan could also make their first starts since the previous round’s 1-2 victory at West Brom to help give Fernandinho, David Silva and Kevin De Bruyne a well-earned rest after three starts in seven days for the midfield trio. Wolves have had a blistering start to the season on both league and cup fronts, sitting firmly at the top of the Championship and knocking Southampton aside in the cup’s previous round. Like City, Wolves are top scorers in their division with the highest goal difference, scoring 24 goals while only conceding 15 in their 13 games this campaign. 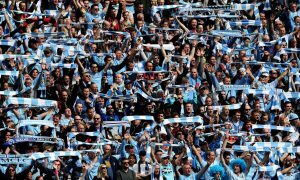 Fresh from their 3-2 victory against Preston North End at Molineux on Saturday, the Wanderers will visit the Etihad with high confidence, backed by 5,500 fans packing the South Stand’s third tier. If Nuno Espirito Santo’s 11 changes to his team at St Mary’s is anything to go by, the City faithful won’t see a first choice Wolves side. However, under the bright lights of the Etihad, Wolves could contract cup fever and field a much stronger line-up. Wolves striker, Leo Bonatini, today claimed his side are “not scared of Manchester City” and, having scored twice at the weekend to bring his tally to four from three games, he appears the one to watch on Tuesday night. Atletico Madrid loanee and the club’s joint top scorer, Diego Jota, may be rested along with dangerous wide-man Ivan Cavaleiro, but this all depends on Espirito Santo’s commitment to the Carabao Cup. However Wolves line up, Southampton’s lesson is one the Blues must learn from to avoid fatally underestimating their opposition’s squad depth. I’m going with a fairy tale evening for Aguero and City, earning their 12th win on the bounce and Sergio scoring to break Eric Brook’s record that has stood firm since the start of World War II. Brook did score the 178th goal himself, in 1940, only for it to be wiped from the record books after the old Division One was suspended due to the outbreak of war. Barring any major war declaration before the end of the season, fingers crossed, I believe this will be the night a player’s 178th Manchester City goal is finally registered. I’m confident that the Blues’ mix of energetic youth, Yaya’s command of the midfield and a penetrating forward line, whoever may be in it, will be too much for any Wolves side.